The ORIGINAL Infanteenie Beenie™ newborn hospital hats are made for baby's first moments and we offer the only newborn hat that is guaranteed to fit and stay snug to your darling baby girl's precious head. 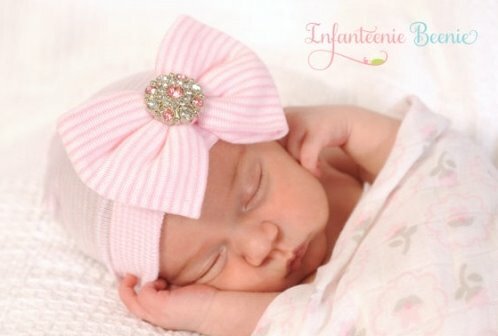 From the moment your sweet baby girl takes her first breathe to the moment she takes your breathe away,... proudly announce that you just had a baby girl with Her First Bow™ newborn hat!! In super-soft medical grade knit fabric with delicate detail, each piece is designed by me for baby's every day. Your little girl can be kept snug in this Infanteenie Beenie™ Boutique Hat.